On June 27th at 5.30pm, Polis will launch a new report exploring the challenges and opportunities in reporting distant suffering. 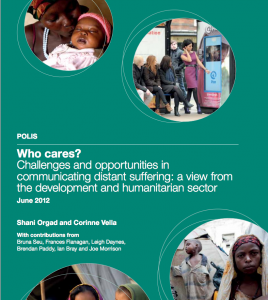 The report written by Dr Shani Orgad based on research by a team from LSE and Birkbeck College will be of interest to NGO’s and Journalists working within marketing and media coverage of disasters, human rights and development. Speakers at the launch event will include Giles Hedger from Leo Burnett and Lord MacGregor, chair of the Lord’s Economic Affairs Select Committee. The report includes case studies written by staff from Save The Children, Oxfam, the Disasters Emergency Committee and Plan UK. The report follows a conference on the issues held with UK international NGOs and other experts. To attend the launch, to get a copy of the report or to get on the mailing list for future events and reports on this subject, please email polis@lse.ac.uk. For the full report please click here and here.